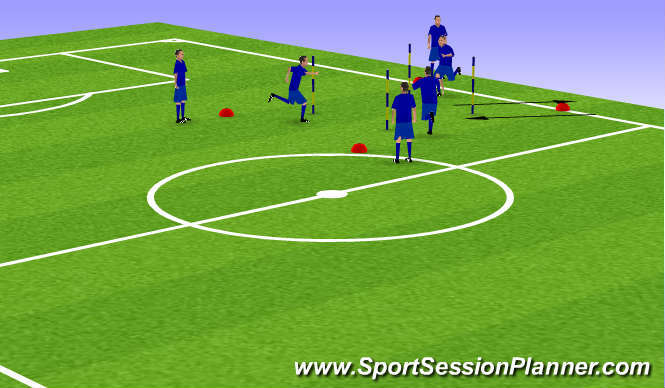 Perform a variety of dynamic warm-up excercises (e.g., high knees) forwards and backwards with a focus on intensity/quality of athletic movements and spatial awareness (i.e., all players arrive at markers at the same time). 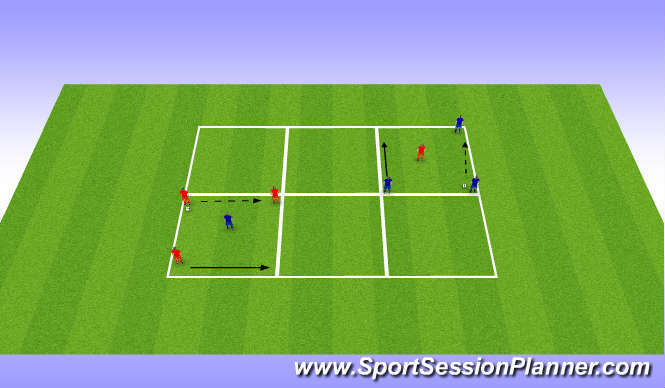 1) Players dribble at the same time to the gates, perform a turn and go to their right. 2) Players dribble at the same time to the gates, perform a turn, go to their right and then play an angled pass. 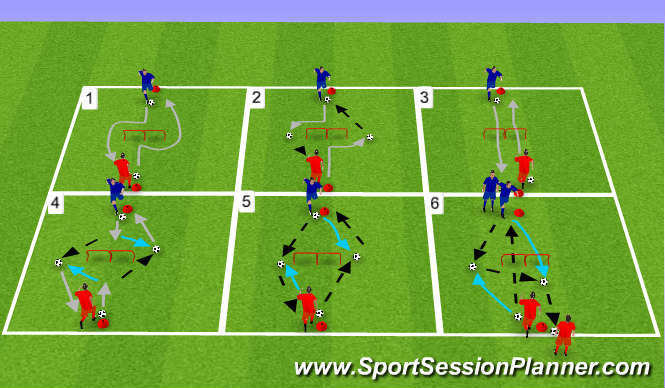 3) Players dribble at the same time over the gates. 4) Players dribble then lay a pass into space and move to the opposite side to recieve the pass played from the opposite player. Players then dribble back to the start. 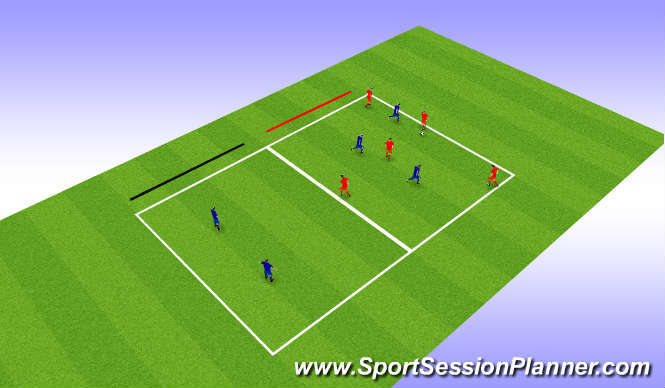 5) Players lay a pass into space and move to the opposite side to recieve a pass. On recieving the ball the palyer turns and passes back to the next player. 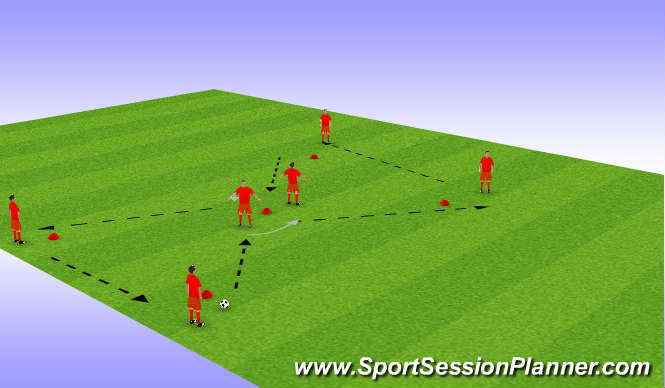 6) 1 touch pass combination with 1 ball only. The red player passes through the gates and moves to the left to recieve the ruturn pass from blue. Then then lays the ball off into space for the blue to run onto while jumping over the gates. Blue then passes back to the start. Emphasis on opening up hips and receiving pass across body; and when performed with two balls simultaneously, spatial awareness and timing as well. Attacking players without ball need to provide options to both the left and right of the player with the ball. 5 Attackers vs 3 Defenders in attacking teams side of grid. Emphasis on maintaining possession, transition from offense to defense and vice versa.